Welcome to the last part of this course on Advanced Harmonic Concepts. We will now take a step away from the related dominants and we will explore the chromatic 25 progression. The descending chromatic 25 can appear in several situations, one of the most common of which is replacing a descending diminished chord. 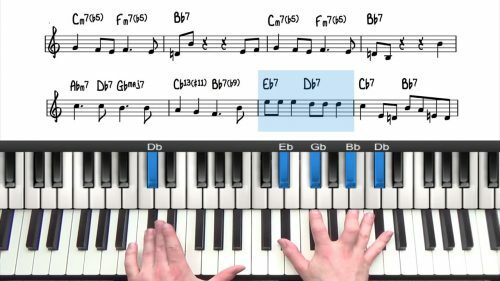 We will extend this basic progression with the chromatic 25 progression and discuss how we are substituting the chords. Apply to "There Will Never Be Another You"
We can apply the descending 25 progression to the tune "There Will Never Be Another You". This is most commonly applied in the last 4 bars of the B Section, let’s see how this sounds. A little disclaimer; these choices might not work with the melody of the tune, and in general, you should use them with caution. By using only one melody, we managed to find a lot of material to use, and it has hopefully opened our mind and our ears to the different keys and harmonic relationships. 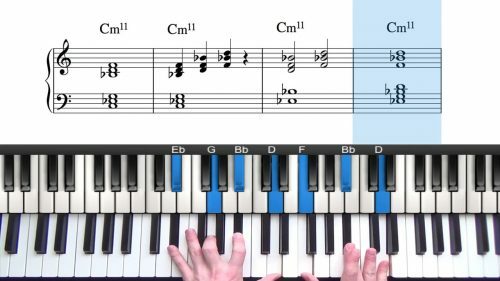 The contents of this course are just one perspective of the harmony, and there are numerous other ways to the same result, which is a better understanding and hearing of music. ‘Somewhere Over The Rainbow’ has also been played by many great jazz musicians over the years. 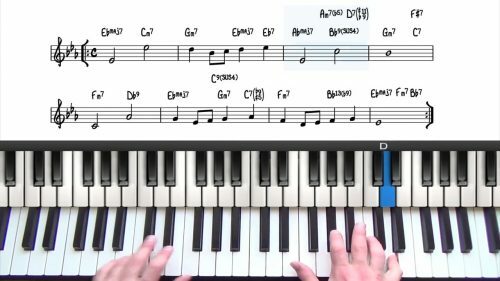 In this lesson we create a solo ballad arrangement. Take the harmonic concepts from related tunes Bye Bye Blackbird and Jeepers Creepers through all the keys. First, with the original harmony, and then with the chromatic 25s. When you learn new tunes and apply this idea to them, you will find out how everything is connected.